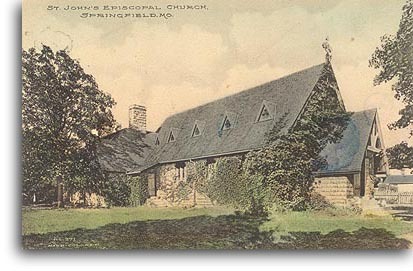 St. John's Episcopal Church began in 1881 when the Reverend Octavious Parker bought a lot at the corner of Boonville and Park Street from the Ozark Land Company for $50.00. The church received the adjoining lot at no charge. Occasional services were held until March 29, 1886, when the first regular meeting of the church was held at Good Templar's Hall on Commercial Street. Reverend Melville M. Moore came from Nashville, Tennessee, to be the first rector of the new church. The two lots on Boonville were sold in 1886 and two lots on the corner of Benton Avenue and Division Street were purchased for $3,000 and the new building for St. John's Church was built in 1888. It was built in the late English-Gothic style using limestone and timber. It has overhanging eaves and the roof is supported by open timber trusses. The interior woodwork is yellow pine. At the time the church was built the walls were decorated with stenciled borders and medallions. The windows are mosaic colored glass. The Rose Window, over the front entrance, is the only one of its type in the middle United States. The first service was held in the church on Sunday, September 23, 1888. In 1892 the first addition was made to the building. The hand-colored photograph in the postcard was clearly done after this 1892 addition. It is postmarked 1911. A choir was begun in 1894 and in 1895 a mission was started in a vacant storeroom on Broad Street, just north of the Frisco Railroad tracks. A new rectory was built on the southwest corner of the church property in 1900. The photograph in the postcard is taken at such an angle that it is not possible to see the rectory, if it existed at the time. In October of 1927 the Reverend Lewis R. Anschutz became rector of St. John's Church. He was a close friend of Franklin D. Roosevelt and served the church for 18 years. In 1949 the church purchased the Crutcher home at 1518 Benton, which was north of the Rectory. It was named Spencer Hall after a former rector of the church and was used as a meeting place for church organizations. 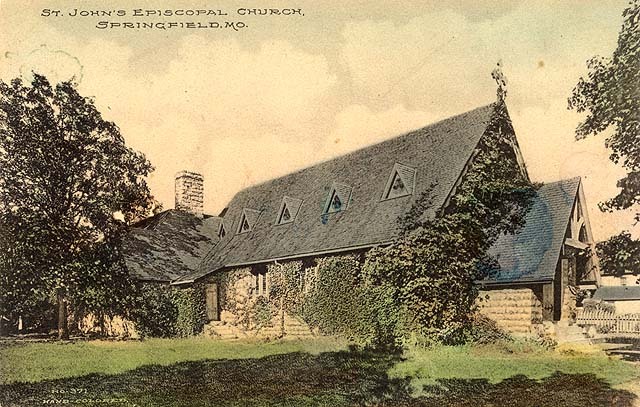 In 1960 Spencer Hall was razed and the Parish Hall was renamed Spencer Hall. In 1964 air conditioning for the church was installed. On April 24, 1994 St. John's Church celebrated the 100th anniversary of the church building.